Saturday the 16th was Icelandic language day, so I have a few little videos to celebrate it. Just recently there was a competition to find the most beautiful Icelandic word. The University of Iceland selected thirty finalists from a cross section of age groups. You can see a list of the words here with the English translation and meaning. The winning word was ljósmóður which means midwife - literally translates to the mother of light. My favourite word from the selection is gluggaveður - window weather meaning weather that is best experienced from behind a window. I imagine that word gets a lot of use here. The below video with the pronunciation of some of the words is from Hulda, who writes the Icelandic Language Blog. Apparently since the competition a couple of guys have started a facebook page to find the ugliest Icelandic word. 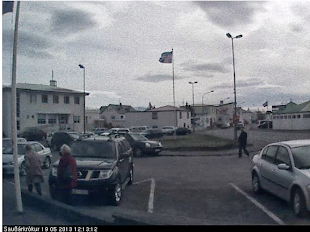 Here are a few more little videos created by school children from Brekkuskóli in Akureyri to celebrate the day. Take a moment to learn the Icelandic alphabet, numbers and colours. Letters Icelandic from WT on Vimeo. Numbers in Icelandic from WT on Vimeo. Colors in Icelandic from WT on Vimeo.